It has been the dominant view that both Syria in the 1980s and Iran today have acted as rogue states in the Middle East threatening to upset the stability of the region. 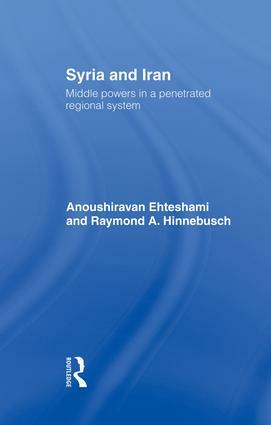 In this innovative new study, Anoushiravan Ehteshami and Raymond Hinnebusch show that these two countries have in fact acted in a rational fashion pursuing the aim of containing Western influence. This book demonstrates how Syrian foreign policy resembles the "rational actor" model and Iran's rational factions in government guide its diplomacy. Syria and Iran's foreign policies are shown to be conventional ones, of "realist" diplomacy with their pursuance of a balance of power and spheres of influence. Their alliance with each other is also closely examined and found to be defensive in nature. Syria and Iran illustrates how these two countries, and their alliance, forms an integral part of the balance of power in the Middle East. It is an exciting contribution to the study of the region, and its application of international relations concepts will be welcomed by those studying this area. '…well grounded and fluidly written. Syria and Iran inaugurates a research program that is worth pursuing and long overdue.' - Perspectives on Political Science. Anoush Ehteshami is Reader in International Relations at the University of Durham. Raymond A. Hinnebusch is Professor of Arabic and Islamic Studies and International Relations at the University of St. Andrews.